Join us this Sunday as we enjoy Holy Communion with our Lord Jesus. 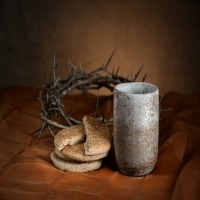 Bread and wine—though at Freedom Church we use unfermented grape juice. All Christians are welcome at the table of the Lord, whatever their denomination. Holy Communion is a family meal, and all Christians are members of Christ’s family. Therefore, when we receive the bread and cup, we join with millions of brothers and sisters across the ages and around the world.